Since signing for Liverpool in July 2007, Lucas Leiva’s name has been synonymous with mediocrity, a shining example of Rafael Benitez’s supposedly poor record in the transfer market. Here was a player who evidently couldn’t hack it in the Premier League, unable to cope with the pace and power of England’s top division. Struggling with the ‘can’t perform on a warm Saturday in August let alone a cold Wednesday in February’ syndrome. Lucas was heavily criticised in the media, dubbed ‘Matt Lucas’ by 606’s Robbie Savage (which only he, presumably, found amusing), and provided a source of frustration for Liverpool fans, some of whom vented their anger towards the Brazilian in uninspiring Anfield displays. Perhaps the main problem with Lucas was that he was hugely overshadowed. He first served as a deputy in a central midfield of Steven Gerrard, Xabi Alonso and Javier Mascherano, three world-class talents, and could never provide the quality to compensate for the absence of any of the trio. Alonso’s departure meant more responsibility, which he didn’t immediately revel in. It was eventually Mascherano’s move to Barcelona in the summer that appears to have inspired the best out of Lucas, despite Liverpool’s indifferent showings under Roy Hodgson. The overriding criticism of the Brazilian from Liverpool fans was his tendency to pass sideways and backwards, instead of forwards. Perhaps this was a case of leaving the responsibility to others; why go for the Hollywood ball when you have Gerrard, Alonso or even Mascherano in your team. But as Alonso left, results slipped and Gerrard and Mascherano’s form wavered, Lucas was perhaps unfairly targeted; a scapegoat in disappointing times. However, Lucas’ performance on Sunday at Stamford Bridge was a step away from ugly duckling and towards Brazilian beauty. Compared to his performance last season at Chelsea (where he was subbed after 76 minutes), Lucas not only appeared to dictate the play at the bottom of a midfield diamond, but also put to bed criticism about his ability to strike a forward pass. With a back five there would always be a number of sideways passes 20-30 yards from his goal, but observe the number of passes crossing the halfway line, including greater ambition in the opposition half compared to 16 months prior. Since Dalglish’s arrival, Lucas has grown in confidence, aided by the improved form of Steven Gerrard and Raul Meireles. His passing accuracy in his five league matches under Dalglish has been 89% (Chelsea), 89% (Stoke), 79% (Wolves), 84% (Everton) and 78% (Blackpool). For comparison, the top passers in the Premier League this season have been John Obi Mikel (89%), Michael Essien, Alex Song (both 87%), Barry Ferguson (83%) and Danny Murphy (81%), but as seen above, Lucas has shown ambition in his passing, even if not quite at the standard of Xabi Alonso. 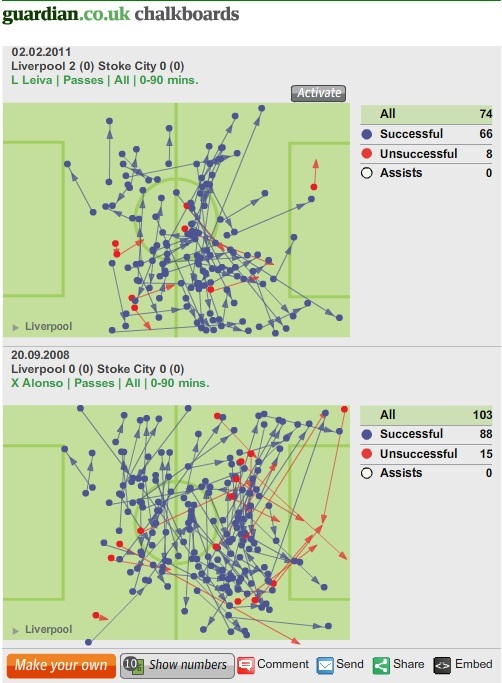 It’s not only been improvement under Dalglish though. In Liverpool’s 2-0 home win over Chelsea in November, Lucas was Liverpool’s best player, competing with Chelsea across the midfield. His counterpart John Obi Mikel, deepest in a midfield also including Yuri Zhirkov and Ramires, contested only two tackles. Admittedly this was Liverpool under Hodgson – defensive and counterattacking – but Lucas’ performance at Anfield was indicative of a season of improved defensive work; he is the fourth most successful tackler in the division this season. It’s funny how first impressions and stereotypes stick in football. Your average football fan probably still sees Lucas as the bumbling and talentless central midfielder serving as an indictment of Rafael Benitez’s reign. This couldn’t be less true. Having recently only turned 24, the same age as new signing Luiz Suarez, Lucas has the time and has shown the potential to become a mainstay of Dalglish’s new Liverpool. Note: Guardian Chalkboards don’t seem to like embedding themselves into this blog, and so any links from the chalkboards will not work. ← Howard Webb: Manchester United’s 12th Man? Although I’ve never been a huge fan (or fan) of Lucas before the beginning of this season I think his poor form of the past was due to a number of factors. At the age of 20 to come into a side that, as you rightly say, has Alonso, Macherano and Gerrard in it is a huge step up from playing South American football. Not only is the style of play different but the pressure is immense. I think Lucas has finally learnt his position and, though this took much longer than it probably should, may well get better and better. I think it’s fair to highlight how good and an important player Lucas is becoming to Liverpool, but it has been helped also by Raul Meireles stepping up to the plate. That plus using the Chelsea games as an example doesn’t necessarily tell the whole story, particularly in comparison to Mikel Obi. In the game at Anfield, it was one of our worst performances for quite a while, plus Chelsea spent most of the second half battering the door down so Mikel didn’t need to make tackles whereas Lucas did. It’s similar to problems of comparing refeering bias to big teams to smaller sides on the basis because if the big sides spent more time with the ball, obviously the opposition are more likely to commit more fouls/have more decisions given against them. 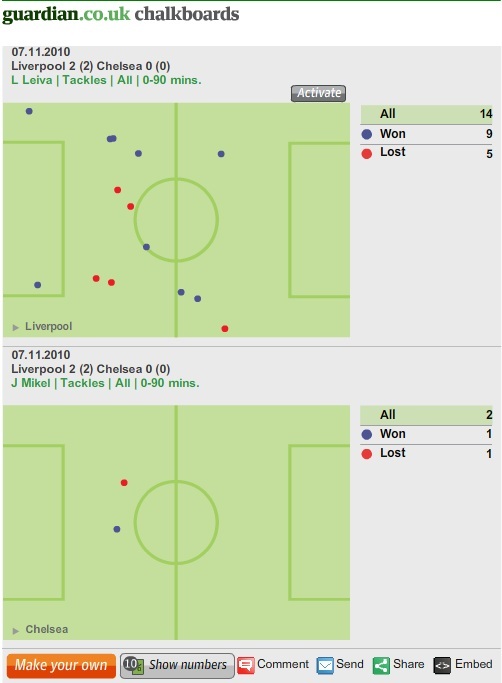 I agree that Mikel didn’t need to be involved as much at Anfield, and I’ve acknowledged that as well as the help of Gerrard and Meireles’ improved form in the post, but I think saying it was Chelsea being poor takes a lot away from Liverpool’s central midfield made them play poorly. 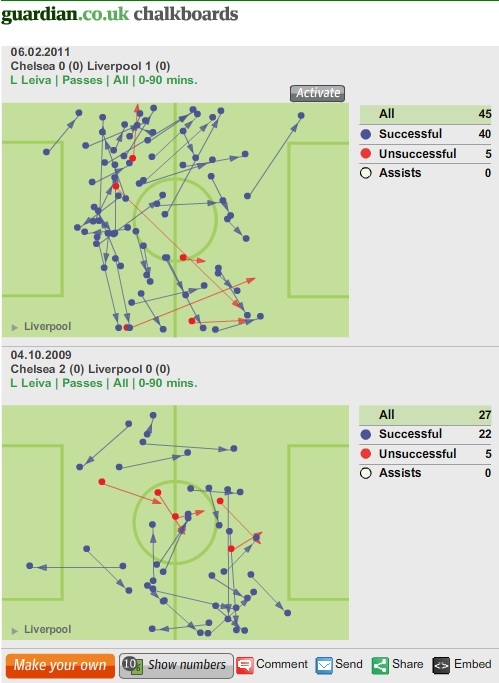 The lack of creativity and penetration was because of the work of Lucas, Meireles, Gerrard in the two games. Just looking at Mikel’s tackles across a few games this season, he appears to average 8-9 tackles a game, which is how many Lucas competed in yesterday, despite having only an ok performance. The point from that is that Lucas continues to overlooked by many neutrals (although that tide is turning), when his performances suggest he is doing a good job.